The Seminar was designed to open up space for the discussion of emerging critical trends in the humanities in response to urgent global social, political and cultural challenges. There were discussed insights into the nodal points of global decolonizing processes as seen from the perspective of digital humanities and posthumanism/ecocritical thought. Bringing digital humanities and ecocriticism/posthumanism into the postcolonial framework, the two invited speakers will examine the new opportunities for a critical intervention into postcolonial paradigms enhanced by cultural and literary translation studies, comparative literature, decolonial studies, political ontology and ecology, and posthumanism in general. Prof. Nirmala Menon discussed the larger question of Decolonizing Digital Humanities keeping in mind the issue of language use in scholarship and its consequences for the Global South. She will include in her discussion her project of decolonizing digital humanities through open access publishing initiatives. 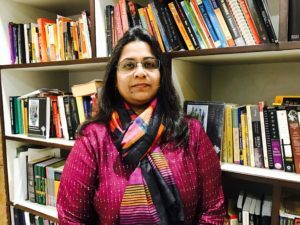 An internationally acknowledged scholar in digital humanities, Prof. Menon leads the Digital Humanities and Publishing Research Group at the Indian Institute of Technology (IIT), Indore, India. She is Associate Professor of Humanities and Social Sciences (HSS), Discipline of English, IIT Indore. She is the author of Migrant Identities of Creole Cosmopolitans: Transcultural Narratives of Contemporary Postcoloniality (Peter Lang Publishing, 2014) and Remapping the Postcolonial Canon: Remap, Reimagine, Retranslate (Palgrave Macmillan, 2017). The Digital Humanities Research students at IIT Indore she supervises work on exciting projects that include developing Partition Archives, and a Multilingual Database Development Project, among others. The Digital Humanities Group is also the Coordinator of KSHIP- An Open Acceess Multilingual Publishing Project initiated at IIT Indore and will soon be publishing the first ever Multilingual Volume of Electronic Literature from India. The discursive apparatus of postcolonial critique has long articulated itself within and across grammars of difference. Some of postcoloniality’s central questions resolve around the navigation of difference, its translations, and the ethico-political imperatives to analyse, reflexively, the differences the question of difference makes to critical thought and action. Difference and critique emerge, however, for what has become orthodox postcolonial criticism, from a discursive tradition that frames both the question of difference, and the subsequent question of critically navigating a responsibility to difference, from a representationalist epistemic practice. Recent work in the social sciences and humanities suggests, however, that this normative tradition limits the capacities of postcolonial criticism, in particular its ethico-political justifications, to adapt to the plural demands of entangled lifeworlds. Drawing from new interdisciplinary work in anthropology, human geography, bio-semiotics, indigenous studies, environmental humanities, and political ecology, this presentation will argue for the need to re-think epistemic questions of postcolonial difference and critique, and specifically their ethico-political significance, in light of ontologies of radical inter-dependence. Instead of reflexively negotiating the limits of the sayable qua criticism, the paper will argue for how care, rather than agonism, is the constitutive ground for thinking about, and with, postcolonial difference. The presentation argued that critique transform from reflection on ineluctable conceptual limits into practices of mutuality. It concluded by exploring examples of mutuality that practice care as a form of critique open to vulnerability and affirmative resilience. 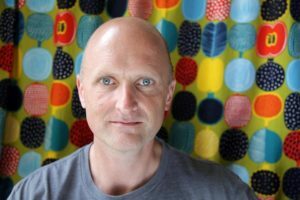 Dr. Mark Jackson is Senior Lecturer in Postcolonial Geographies, School of Geographical Sciences at the University of Bristol, UK, and editor of Routledge Research in New Postcolonialisms series. His recent book includes an edited volume Coloniality, Ontology, and the Question of the Posthuman, Routledge, 2017. The Seminar was financed from the grant provided by Riksbankens Jubileumsfond.